...As I Remember It...: Show Me What You Workin' With! This is what I was working with today!! Yep... it was so nice and peaceful at the beach. I had to snap a shot and share it with all of you. 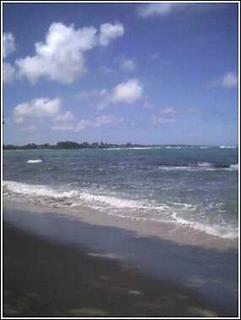 I sat on the soft sand, staring at turqoise-blue waters... ocean breeze on my skin... sun on my shoulders. It was lovely. I love the sun. You know we NEED it's rays of light to produce vitamin D. Go look it up. It's true, I tell ya! I love the soothing powers of the color turquoise and the color blue. I'm into the whole holistic way of looking at colors. That stuff is true as well! God painted such a beautiful picture today! I'm grateful. I'm peaceful. I'm in love with life! Take care! What a beautiful sight. Thanks for thinking of us and sharing. Ok, what did I miss? When did you move back to Hawaii??? It sounds so wonderful there! I would love to visit. I was just watching the news this AM when they said your gas over there is now $3/gal.!! Take care and keep soaking up that Vitamin D! I tell you, a girl from Iowa don't get to see that too often. Thanks for taking a minute out of your day to share the beautiful pic. Can't wait to dip my feet in some turquoise blue water again. April was only a few months ago, but it feels like YEARS now.